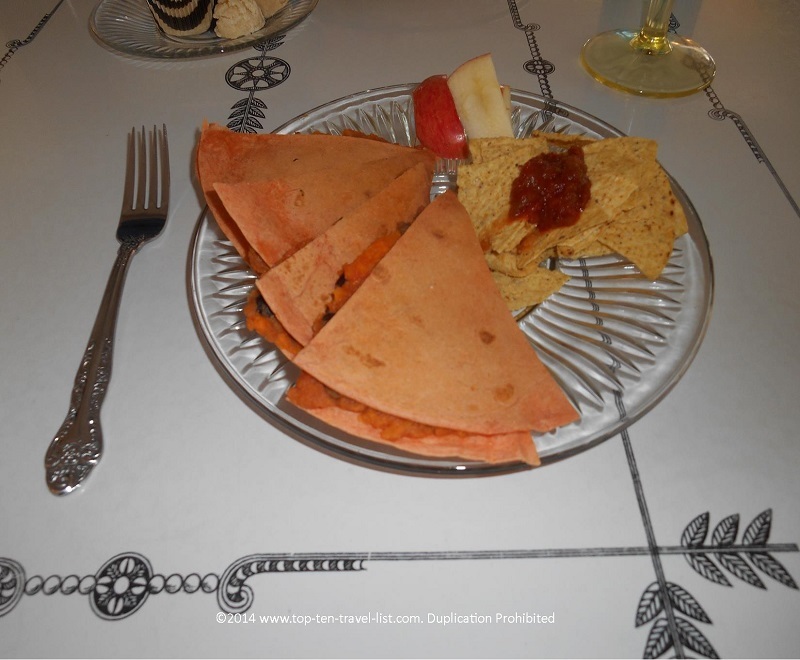 An Unexpected Vegetarian Treat in Upton, Massachusetts - Top Ten Travel Blog | Our experiences traveling throughout the US. 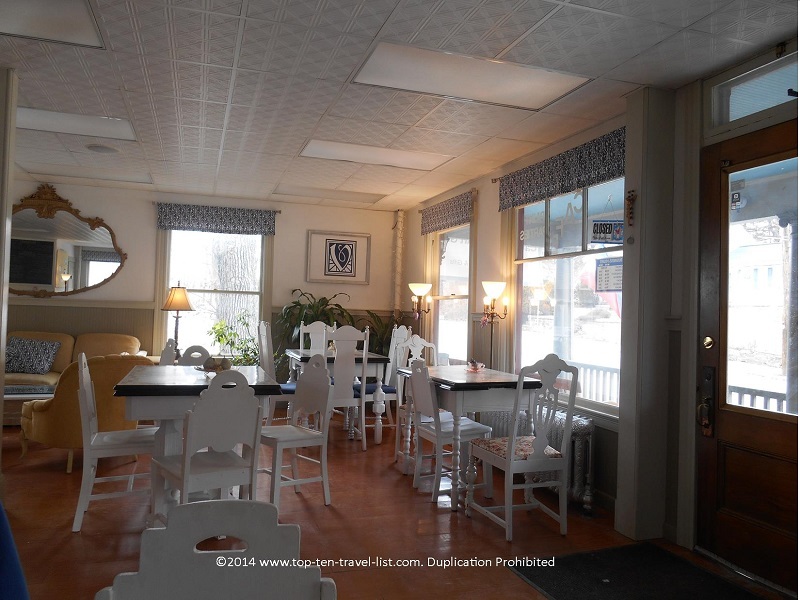 In the small town of Upton (about 30 minutes from Worcester) lies an unexpected hidden gem: a cozy vegetarian restaurant/coffee shop with excellent food, service, and a charming atmosphere. This past weekend, Mike & I were out in the area when we discovered this fantastic place called V Organic Cafe, an all vegetarian (and mostly vegan) cafe. I was pleasantly surprised with everything about this place. Going in, I wasn’t sure what to expect from a small vegetarian cafe in the middle of nowhere. However, our experience was great and we will definitely be planning a return visit. V Organic Cafe offers an inviting atmosphere. Most vegan/vegetarian restaurants sorely lack in the design department. This cafe, on the contrary, is very bright and appealing. There are large windows which look out into the woods, comfortable couches, nice artwork, and plenty of space! After visiting many small vegetarian restaurants around Massachusetts, it was nice to be able to spread out and breathe. We ordered from the lunch menu, which includes an assortment of wraps, sandwiches, salads, and soups. Smoothies, organic coffee and teas, daily baked goods, and organic handmade truffles/sweets are also on the menu. Everything is dairy free, including the smoothies and desserts, which is great for both vegans and lactose intolerant individuals. A wide variety of gluten-free lunches and treats are also available each day. I ordered the “Judy Chicago,” a tomato flavored quesadilla filled with sweet potatoes and black beans. I wasn’t sure how the 2 ingredients would work together in a quesadilla but it turned out to be really tasty. So good in fact that I bought the ingredients to duplicate the meal myself at home! 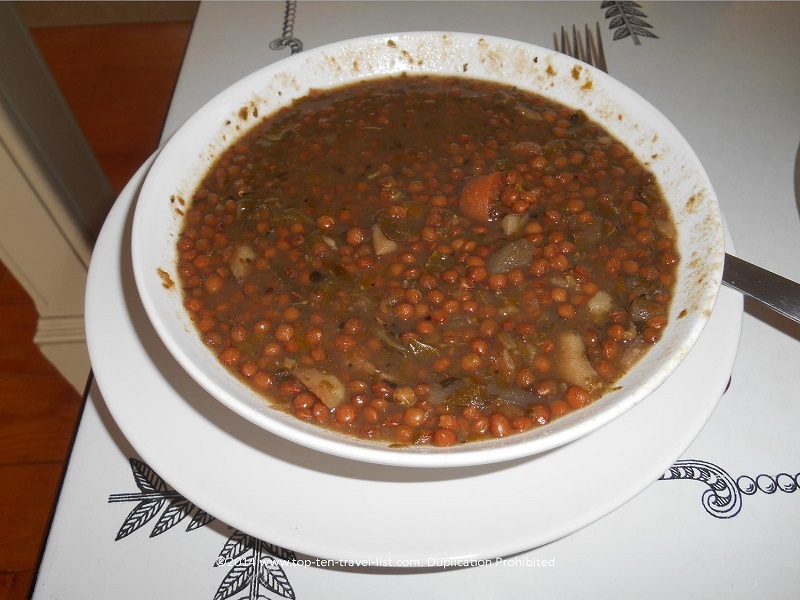 I also ordered a bowl of the soup of the day (lentil), the perfect delicious treat for a cool afternoon. Mike ordered the “Frida Kahlo,” a burrito filled with veggies, re fried beans, and Daiya cheese (a dairy free alternative). We both thoroughly enjoyed our meals. 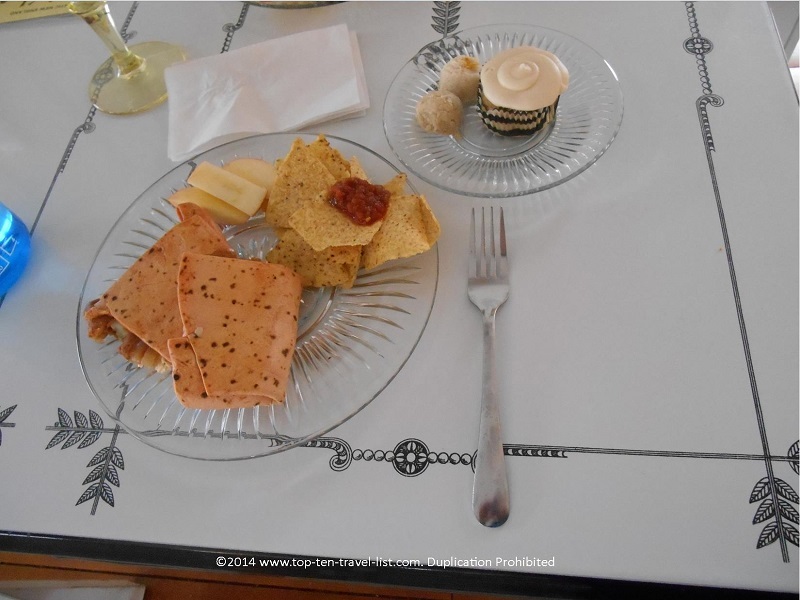 Our meals included a side of apple slices and tortilla chips with salsa, which was fine with us. However, the friendly employee felt bad for the lack of sides for the day and gave us a a few free desserts (lemon and coconut macaroons and a cupcake)and a pot of tea (teas include several varieties by local company Upton Teas), which were all excellent. Great service here, possibly the best I have experienced in the state. While waiting for our food, we were able to take a browse around the art gallery and gift shop (where you can purchase tea pots and other cute knick knacks). V Organic Cafe has a great upscale casual feel, making it the perfect place to stop for an afternoon lunch and pot of tea. We both really enjoyed our afternoon out. I am eager to head back over for Sunday Brunch! V Organic Cafe serves lunch Tuesday-Friday from 10:00am-3:00pm, dinner on Friday from 5:00-9:00pm, and brunch on weekends from 10:00-3:00pm. 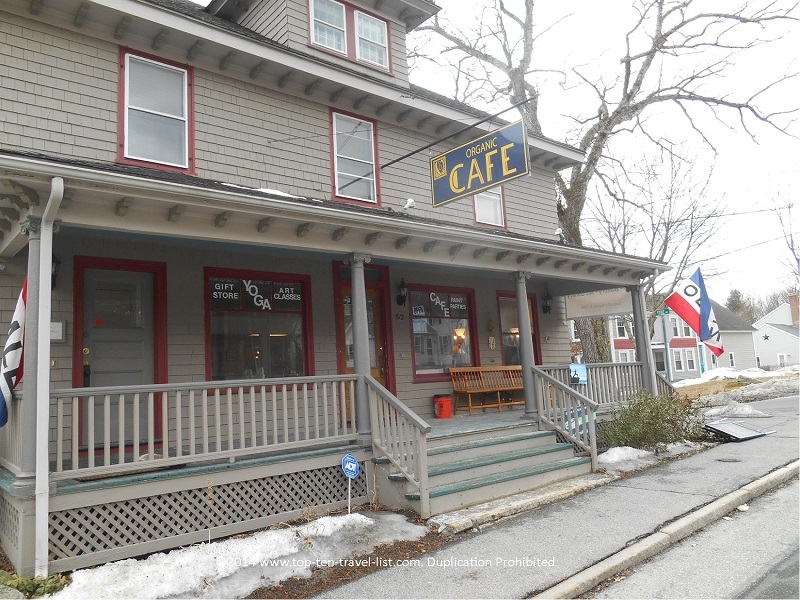 The cafe is located at 62 Main St in Upton, Massachusetts.